This is part of the Horizon(tal) series. Generally, the series combines my exploration of Fliptychs with the stark winter water. This shot has the mountains too, which add a bit of complexity. And the light leak adds a bit of interest as well. Fliptychs can be found here. 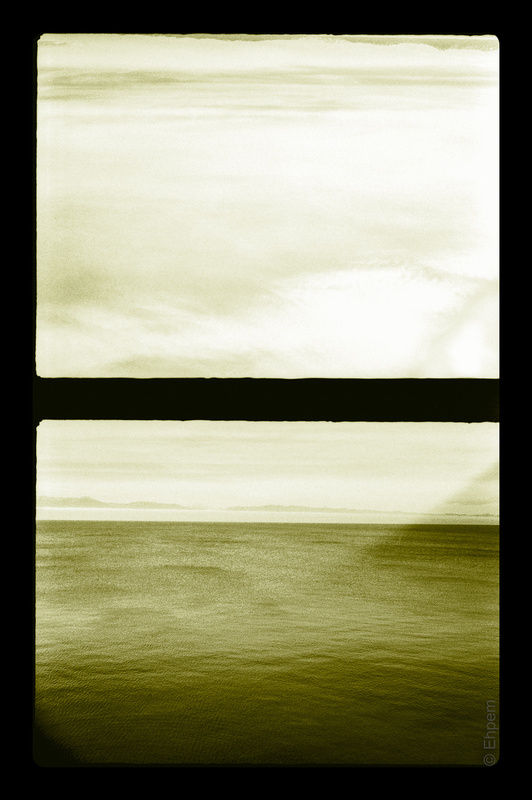 The horizon(tal) series can be found here. This is also another in the larger category of half-frame photos. Beautiful! I love this series, ehpem. Thank you Karen – I am very glad to hear that from you, with your fantastically discerning eye it is very pleasing to me. Wow, I am really surprised how much I love this! So simple but also complex in the variations of tone and light. “Very noice”, as some of us Aussies might say! I see I put this comment in the wrong post – so am moving it: Hi Katherine – thanks. I was posting quite a few of these a few months ago before you returned to an active blogging role – that was before the Pen developed a few problems and I set it aside for the time being. You can find a bunch of them here and other places too. They are some of my favourite pictures of the past many months.